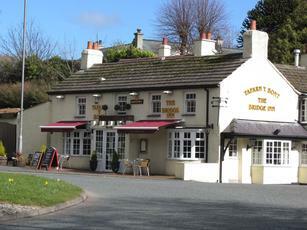 This is a Marstons pub on the roundabout on the Anglesey side of the Menai Bridge. Beware of opening times. Their website advertises that it opens at 11am. But at 11:30 it still wasn't open. This wasn't too much of a problem, as the Anglesey Arms is just opposite and was open. The interior has a few different small rooms, with an outdoor area at the rear. The specials menu looked tempting, with plenty of fish dishes. Ales were Ringwood Boon Doggle & Old Thumber & Brakspear Varsity Pale. Marginally better than the Anglesey Arms. But nothing particularly exciting.